The first publicly available Level 2 electric vehicle (EV) charging station in Winona, Minnesota opened for use in the summer of 2018, hosted by Bluff Country Co-op, a community-owned grocery store. Like many other EV charging station host sites, Bluff Country wrestled with the question of whether to charge user fees. Ultimately, they put in place a novel approach for covering the electricity costs generated by the charging stations: they ask for a suggested donation of two dollars per hour of charge. The process behind providing the Winona community and passersby with a public place to charge their EV tells a story about how a community can provide both the expertise and demand for sustainable solutions, when the time is right. An opportunity to build an EV charging station at Bluff Country came at the perfect time for all parties involved. The co-op had been making steady progress on an array of efforts to operate more sustainably. Two years earlier, the co-op had installed rain gardens; a year before, they worked with Xcel Energy to implement more energy efficient equipment and practices into the day-to-day operations of the co-op. By 2018, the co-op was eager to keep the sustainability momentum moving, and they decided on an EV charging station. Winona is part of an initiative called Cities Charging Ahead!, a Minnesota-based, voluntary group of peer cohorts dedicated to learning and progressing toward electrifying transportation in each cohort’s city. As a result, the community had already laid the groundwork to be ready for EV infrastructure. While the city government was making steady progress, Bluff Country co-op, seeing the benefits, recognized an opportunity and began their own process of installing a Level 2 charging station. Opening in August of 2018, the Clipper Creek 32 Amp model charging station provides drivers with a place away from home to charge their EV. Working with EV owner and all around expert Bill Gehn, Bluff Country realized that while the electricity was cheap (around one dollar per hour), the fees for credit card services and connection subscriptions could quickly add up. As a result, Bluff Country decided to install a “dumb charger”(i.e., one that can be used without payment) and encouraged donations instead to help fund the station. Bluff Country does not track the exact amount received through these donations, but it appears there is steady use of the station based on conversations with co-op cashiers about the frequency of donations. 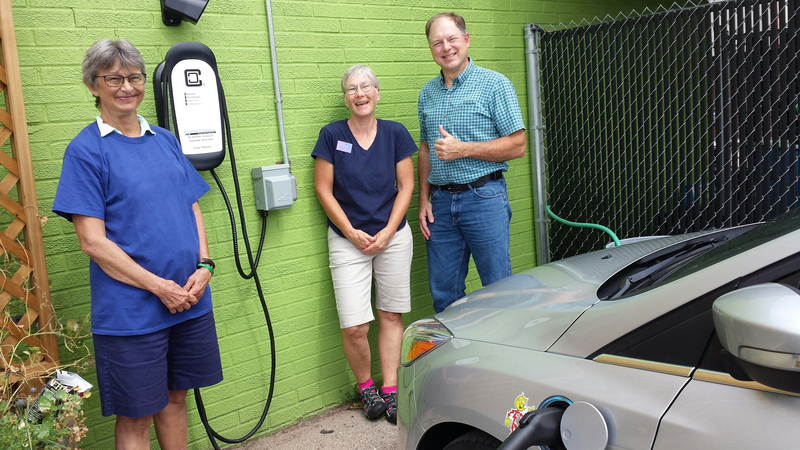 This charger brings positive benefits to the Winona area and to EV drivers in the state, enabling more EV visits to the area and has generated enthusiasm for more EV infrastructure development from community members. The story of Bluff Country demonstrates how important community engagement can be when it comes to making a change. Private businesses can install EV charging stations much more quickly than local government, and by doing so, can provide the visibility needed to create a culture supportive of EV infrastructure at the city level. The suggested donation model fits perfectly in line with the mission of the co-op, allowing people to come together to support cleaner transportation while supporting organic, sustainably sourced foods. If you are ever in the Winona area and in need of a charge, check out Bluff Country Co-op.